On Saturday I spent a lovely day with quilting friends. We had good food, beautiful show and tell, lots of great conversation and a few people even did a little bit of stitching. Lois is the perfect hostess. She recently moved into a new home, and this was my first visit there. Besides being a gracious hostess, Lois is an awesome quilter. I love how she uses her quilts to decorate her home. I'd like to share some photos of our get together with you. This is Lois's Shoreline Log Cabin quilt from Judy Martin's Log Cabin Quilt Book on page 104. This is the actual quilt you see published in Judy's book. Isn't it gorgeous? It looks perfect on the bed. Lois used an armoire' as a beautiful display for some of the quilts she has made. I don't recall the name of the pattern for the quilt hung over the couch, but it looks perfect there. By the way, Lois' husband Bob does beautiful wood work. He made the quilt hanger used to hang this quilt as well as the quilt racks and ladders in all of the photos. I have a few of these in my home as well. 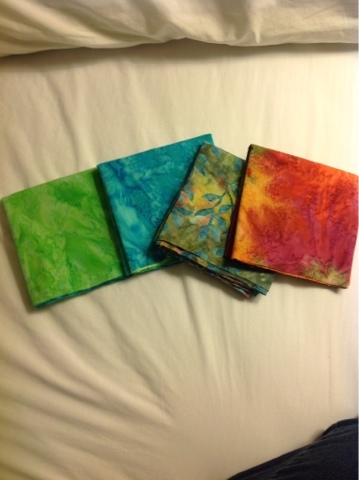 Lois also made the pillows from gorgeous batik fabrics. I love these quilts...especially the Omigosh quilt on the bottom left ladder and the one above it with the gold stars. Lois taught at Quiltmakers, one of my favorite quilt shops. The girls at our Saturday gathering used to meet at the shop on the first Friday night of every month for Friday Night Finishing School. Lois was always working on an interesting quilt from a pattern or book in the shop. The shop closed about 4 years ago, but I still have a lot of these same patterns on my to do list. Take a look at the little miniature quilts on the table at the left of the photo. Lois made the quilts and Bob made the little quilt rack. The guest room was done in Americana. The quilt on the bed is from the book Women of Grace and Charm by Blackbird Designs. Beautiful feathered star wall hanging in the kitchen. I believe Cindi Edgerton reduced this pattern so Lois could make it as a miniature. This one is a Jinny Beyer quilt. I have no idea how many flying geese are in this quilt. We have a challenge each time we meet. This time we were to make a disappearing nine patch. My friend, Pam, made a disappearing four patch for the challenge. I neglected to take a photo of her quilt on Saturday after it was put together. This photo was taken at our retreat. I also forgot to take photos of the rest of the challenge quilts. Elizabeth was working on these beautiful stitchery blocks. There is a lot of handwork on these. Susie made this Purdue quilt as a gift. Laura made this Shenandoah Log Cabin also a Judy Martin pattern from her Cookies 'N Quilts book. Laura made this cat quilt. 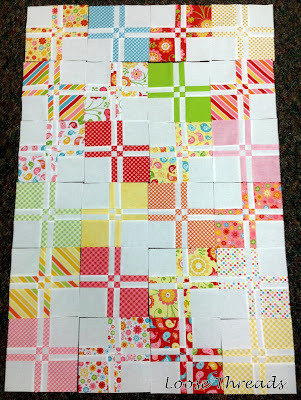 Cute quilt with bright fabrics. Lois made this quilt from one of Judy Martin's patterns. She made the star from one of Judy's block of the months posted on her web site and surrounded it with log cabin blocks. It was fun getting together with friends who all love quilting as much as I do. Thanks to Lois for a wonderful day. 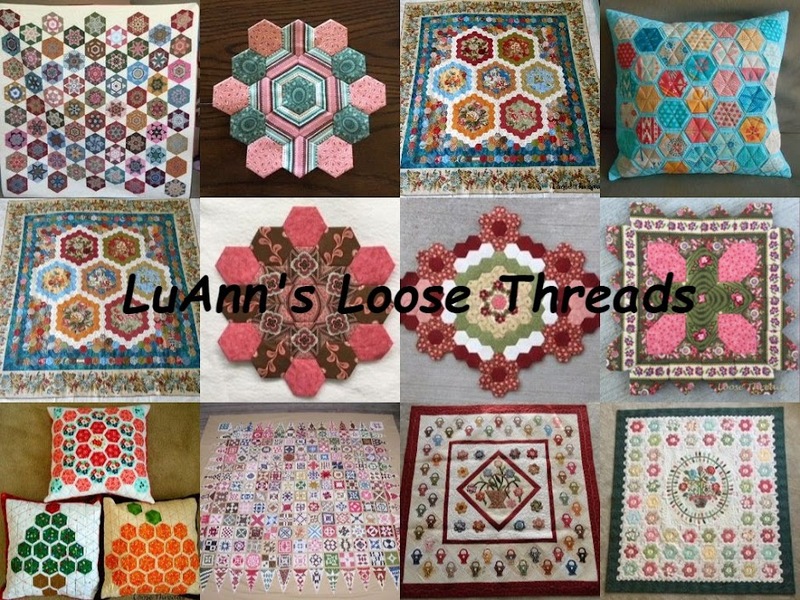 Here are the three Amish quilts that I mentioned in my last post. These quilts weren't quilted when we were there, but the kits were selling like hot cakes. I love this quilt. The stars look like they are spinning. If you can zoom in on these photos, you will see that these quilts are marked to be quilted so they were just finished. I love all three quilts, and it would be hard to pick a favorite. I didn't buy a kit even though it was tempting. You'll have to agree that they sure are gorgeous. These kits are available at Lollys quilt shop in Shipshewana, Indiana. I've been back from the retreat for a few days and have been really busy since I got back to the "real world". We had a great time as usual. Here is Lolly's window display. Solids are really popular there. Next post I'll show you 3 Amish quilts they are selling there as kits. Here are the black and white fabrics shown with a few reds. This quilt combination was my favorite. I love the black and white and lime. Look at this gorgeous stack of fabrics. These quilts are hanging at Yoders. This one is cute with little dolls. Just look at the yo-yos in this quilt. Sorry for the delay in posting. I took a lot of my photos with my camera, and I didn't buy the right connector to port the photos from the camera into my IPad so I could post from the retreat. Now the photos have downloaded into different places in my laptop.....and I'm working on organizing them. I'm back in Shipshewana, Indiana, waiting for our Dear Jane retreat to start tomorrow afternoon. 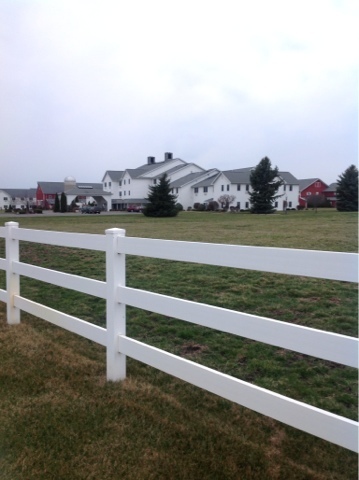 I've checked into the beautiful Farmstead Inn. The first thing I did when I got to town was head over to Lollys and buy a little bag of fabric. I think I might have been so excited that I bought the same batik twice. I'm posting this from my iPad and don't know whether or not the photos will end up in the post or where they will be in the post. If anyone has any tips for posting to a blogger blog using an iPad, I'd love to hear from you. I've finished hand quilting this little tumbler quilt. 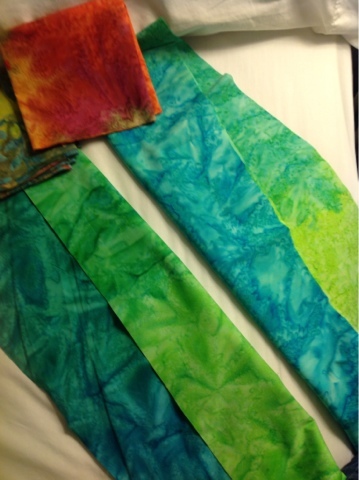 I won the precut tumblers from Kathie at Inspired by Antique Quilts blog last fall. At the time, we were just getting ready to leave for vacation. So I packed the envelope from Kathie along with needle and thread, and I pieced the tumblers by hand while we were gone. I've been slowly hand quilting it, and it's finished. I can't wait to use it this fall. The finished tumblers finish at 1 1/4" high. This photo gives you a better idea just how small they are. I love all of the fabrics. Thanks for a great giveaway, Kathie! You can see my vacation post about this little quilt here.